Paclitaxel (Taxol) is a natural product derived from the yew tree. Within the field of organic chemistry, the definition of natural products is usually restricted to mean purified organic compounds isolated from natural sources that are produced by the pathways of primary or secondary metabolism. Within the field of medicinal chemistry, the definition is often further restricted to secondary metabolites. Secondary metabolites are not essential for survival, but nevertheless provide organisms that produce them an evolutionary advantage. Many secondary metabolites are cytotoxic and have been selected and optimized through evolution for use as "chemical warfare" agents against prey, predators, and competing organisms. Natural products sometimes have therapeutic benefit as traditional medicines for treating diseases, yielding knowledge to derive active components as lead compounds for drug discovery. Although natural products have inspired numerous U.S. Food and Drug Administration-approved drugs, drug development from natural sources has received declining attention by pharmaceutical companies, partly due to unreliable access and supply, intellectual property concerns, seasonal or environmental variability of composition, and loss of sources due to rising extinction rates. The broadest definition of natural product is anything that is produced by life, and includes the likes of biotic materials (e.g. wood, silk), bio-based materials (e.g. bioplastics, cornstarch), bodily fluids (e.g. milk, plant exudates), and other natural materials (e.g. soil, coal). A more restrictive definition of a natural product is an organic compound that is synthesized by a living organism. The remainder of this article restricts itself to this more narrow definition. Natural products may be classified according to their biological function, biosynthetic pathway, or source as described below. Following Albrecht Kossel's original proposal in 1891, natural products are often divided into two major classes, the primary and secondary metabolites. Primary metabolites have an intrinsic function that is essential to the survival of the organism that produces them. Secondary metabolites in contrast have an extrinsic function that mainly affects other organisms. Secondary metabolites are not essential to survival but do increase the competitiveness of the organism within its environment. Because of their ability to modulate biochemical and signal transduction pathways, some secondary metabolites have useful medicinal properties. Natural products especially within the field of organic chemistry are often defined as primary and secondary metabolites. A more restrictive definition limiting natural products to secondary metabolites is commonly used within the fields of medicinal chemistry and pharmacognosy. Primary metabolites as defined by Kossel are components of basic metabolic pathways that are required for life. They are associated with essential cellular functions such as nutrient assimilation, energy production, and growth/development. They have a wide species distribution that span many phyla and frequently more than one kingdom. Primary metabolites include carbohydrates, lipids, amino acids, and nucleic acids which are the basic building blocks of life. Primary metabolites that are involved with energy production include respiratory and photosynthetic enzymes. Enzymes in turn are composed of amino acids and often non-peptidic cofactors that are essential for enzyme function. The basic structure of cells and of organisms are also composed of primary metabolites. These include cell membranes (e.g. phospholipids), cell walls (e.g. peptidoglycan, chitin), and cytoskeletons (proteins). DNA and RNA which store and transmit genetic information are composed of nucleic acid primary metabolites. First messengers are signaling molecules that control metabolism or cellular differentiation. These signaling molecules include hormones and growth factors in turn are composed of peptides, biogenic amines, steroid hormones, auxins, gibberellins etc. These first messengers interact with cellular receptors which are composed of proteins. Cellular receptors in turn activate second messengers are used to relay the extracellular message to intracellular targets. These signaling molecules include the primary metabolites cyclic nucleotides, diacyl glycerol etc. Secondary in contrast to primary metabolites are dispensable and not absolutely required for survival. Furthermore, secondary metabolites typically have a narrow species distribution. Secondary metabolites have a broad range of functions. These include pheromones that act as social signaling molecules with other individuals of the same species, communication molecules that attract and activate symbiotic organisms, agents that solubilize and transport nutrients (siderophores etc. ), and competitive weapons (repellants, venoms, toxins etc.) that are used against competitors, prey, and predators. For many other secondary metabolites, the function is unknown. One hypothesis is that they confer a competitive advantage to the organism that produces them. An alternative view is that, in analogy to the immune system, these secondary metabolites have no specific function, but having the machinery in place to produce these diverse chemical structures is important and a few secondary metabolites are therefore produced and selected for. General structural classes of secondary metabolites include alkaloids, phenylpropanoids, polyketides, and terpenoids, which are described in more detail in the biosynthesis section below. Carbohydrates are an essential energy source for most life forms. 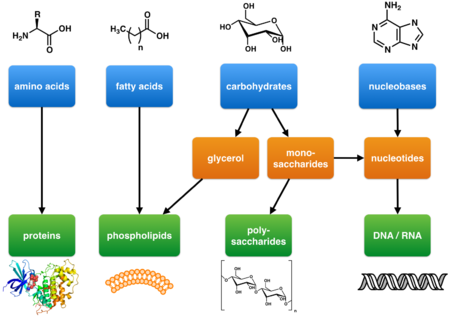 In addition, polysaccharides formed from simpler carbohydrates are important structural components of many organisms such the cell walls of bacteria and plants. Carbohydrate are the products of plant photosynthesis and animal gluconeogenesis. Photosynthesis produces initially 3-phosphoglyceraldehyde, a three carbon atom containing sugar (a triose). :Chapter 8 This triose in turn may be converted into glucose (a six carbon atom containing sugar) or a variety of pentoses (five carbon atom containing sugars) through the Calvin cycle. In animals, the three carbon precursors lactate or glycerol can be converted into pyruvate which in turn can be converted into carbohydrates in the liver. Through the process of glycolysis sugars are broken down into acetyl-CoA. In an ATP dependent enzymatically catalyzed reaction, acetyl-CoA is carboxylated to form malonyl-CoA. Acetyl-CoA and malonyl-CoA undergo a Claisen condensation with lose of carbon dioxide to form acetoacetyl-CoA. Additional condensation reactions produce successively higher molecular weight poly-β-keto chains which are then converted into other polyketides. :Chapter 3 The polyketide class of natural products have diverse structures and functions and include prostaglandins and macrolide antibiotics. One molecule of acetyl-CoA (the "starter unit") and several molecules malonyl-CoA (the "extender units") are condensed by fatty acid synthase to produce fatty acids. :Chapter 3 Fatty acid are essential components of lipid bilayers that form cell membranes as well as fat energy stores in animals. Natural products may be extracted from the cells, tissues, and secretions of microorganisms, plants and animals. A crude (unfractionated) extract from any one of these sources will contain a range of structurally diverse and often novel chemical compounds. Chemical diversity in nature is based on biological diversity, so researchers travel around the world obtaining samples to analyze and evaluate in drug discovery screens or bioassays. This effort to search for natural products is known as bioprospecting. Pharmacognosy provides the tools to identify, select and process natural products destined for medicinal use. Usually, the natural product compound has some form of biological activity and that compound is known as the active principle - such a structure can evolve to become a discovery "lead". In this and related ways, some current medicines are obtained directly from natural sources. a framework that serves as the basis for a structurally different compound arrived at by total/semisynthesis. This is because many biologically active natural products are secondary metabolites often with complex chemical structures. This has an advantage in that they are novel compounds but this complexity also makes difficult the synthesis of such compounds; instead the compound may need to be extracted from its natural source – a slow, expensive and inefficient process. As a result, there is usually an advantage in designing simpler analogues. The serendipitous discovery and subsequent clinical success of penicillin prompted a large-scale search for other environmental microorganisms that might produce anti-infective natural products. Soil and water samples were collected from all over the world, leading to the discovery of streptomycin (derived from Streptomyces griseus), and the realization that bacteria, not just fungi, represent an important source of pharmacologically active natural products. This, in turn, led to the development of an impressive arsenal of antibacterial and antifungal agents including amphotericin B, chloramphenicol, daptomycin and tetracycline (from Streptomyces spp. 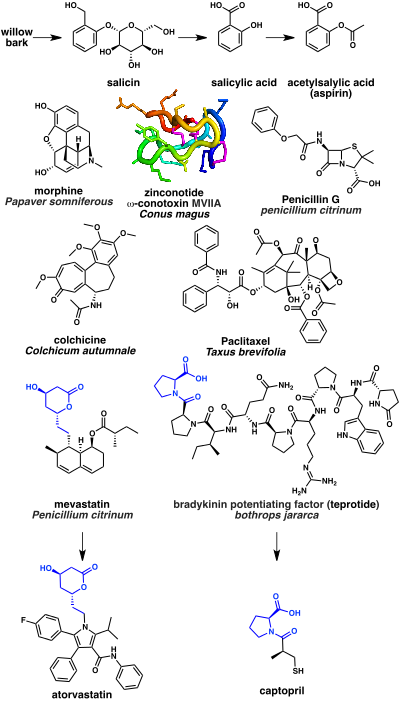 ), the polymyxins (from Paenibacillus polymyxa), and the rifamycins (from Amycolatopsis rifamycinica). Although most of the drugs derived from bacteria are employed as anti-infectives, some have found use in other fields of medicine. Botulinum toxin (from Clostridium botulinum) and bleomycin (from Streptomyces verticillus) are two examples. Botulinum, the neurotoxin responsible for botulism, can be injected into specific muscles (such as those controlling the eyelid) to prevent muscle spasm. Also, the glycopeptide bleomycin is used for the treatment of several cancers including Hodgkin's lymphoma, head and neck cancer, and testicular cancer. Newer trends in the field include the metabolic profiling and isolation of natural products from novel bacterial species present in underexplored environments. Examples include symbionts or endophytes from tropical environments, subterranean bacteria found deep underground via mining/drilling, and marine bacteria. Because many Archaea have adapted to life in extreme environments such as polar regions, hot springs, acidic springs, alkaline springs, salt lakes, and the high pressure of deep ocean water, they possess enzymes that are functional under quite unusual conditions. These enzymes are of potential use in the food, chemical, and pharmaceutical industries, where biotechnological processes frequently involve high temperatures, extremes of pH, high salt concentrations, and / or high pressure. Examples of enzymes identified to date include amylases, pullulanases, cyclodextrin glycosyltransferases, cellulases, xylanases, chitinases, proteases, alcohol dehydrogenase, and esterases. Archaea represent a source of novel chemical compounds also, for example isoprenyl glycerol ethers 1 and 2 from Thermococcus S557 and Methanocaldococcus jannaschii, respectively. Several anti-infective medications have been derived from fungi including penicillin and the cephalosporins (antibacterial drugs from Penicillium chrysogenum and Cephalosporium acremonium, respectively) and griseofulvin (an antifungal drug from Penicillium griseofulvum). Other medicinally useful fungal metabolites include lovastatin (from Pleurotus ostreatus), which became a lead for a series of drugs that lower cholesterol levels, cyclosporin (from Tolypocladium inflatum), which is used to suppress the immune response after organ transplant operations, and ergometrine (from Claviceps spp. ), which acts as a vasoconstrictor, and is used to prevent bleeding after childbirth. 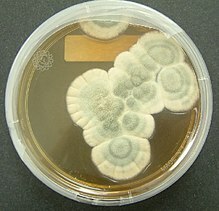 :Chapter 6 Asperlicin (from Aspergillus alliaceus) is another example. Asperlicin is a novel antagonist of cholecystokinin, a neurotransmitter thought to be involved in panic attacks, and could potentially be used to treat anxiety. Animals also represent a source of bioactive natural products. In particular, venomous animals such as snakes, spiders, scorpions, caterpillars, bees, wasps, centipedes, ants, toads, and frogs have attracted much attention. This is because venom constituents (peptides, enzymes, nucleotides, lipids, biogenic amines etc.) often have very specific interactions with a macromolecular target in the body (e.g. α-bungarotoxin from cobras). As with plant feeding deterrents, this biological activity is attributed to natural selection, organisms capable of killing or paralyzing their prey and/or defending themselves against predators being more likely to survive and reproduce. Because of these specific chemical-target interactions, venom constituents have proved important tools for studying receptors, ion channels, and enzymes. In some cases, they have also served as leads in the development of novel drugs. For example, teprotide, a peptide isolated from the venom of the Brazilian pit viper Bothrops jararaca, was a lead in the development of the antihypertensive agents cilazapril and captopril. Also, echistatin, a disintegrin from the venom of the saw-scaled viper Echis carinatus was a lead in the development of the antiplatelet drug tirofiban. In addition to the terrestrial animals and amphibians described above, many marine animals have been examined for pharmacologically active natural products, with corals, sponges, tunicates, sea snails, and bryozoans yielding chemicals with interesting analgesic, antiviral, and anticancer activities. Two examples developed for clinical use include ω-conotoxin (from the marine snail Conus magus) and ecteinascidin 743 (from the tunicate Ecteinascidia turbinata). The former, ω-conotoxin, is used to relieve severe and chronic pain, while the latter, ecteinascidin 743 is used to treat metastatic soft tissue sarcoma. Other natural products derived from marine animals and under investigation as possible therapies include the antitumour agents discodermolide (from the sponge Discodermia dissoluta), eleutherobin (from the coral Erythropodium caribaeorum), and the bryostatins (from the bryozoan Bugula neritina). Indigenous peoples and ancient civilizations experimented with various plant and animal parts to determine what effect they might have. Through trial and error in isolated cases, traditional healers or shamans found some sources to provide therapeutic effect, representing knowledge of a crude drug that was passed down through generations in such practices as traditional Chinese medicine and Ayurveda. Extracts of some natural products led to modern discovery of their active ingredients and eventually to the development of new drugs. A large number of currently prescribed drugs have been either directly derived from or inspired by natural products. A few representative examples are listed below. Some of the oldest natural product based drugs are analgesics. The bark of the willow tree has been known from antiquity to have pain relieving properties. This is due to presence of the natural product salicin which in turn may be hydrolyzed into salicylic acid. A synthetic derivative acetylsalicylic acid better known as aspirin is a widely used pain reliever. Its mechanism of action is inhibition of the cyclooxygenase (COX) enzyme. 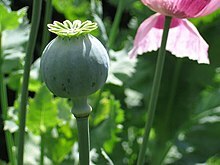 Another notable example is opium is extracted from the latex from Papaver somniferous (a flowering poppy plant). The most potent narcotic component of opium is the alkaloid morphine which acts as an opioid receptor agonist. 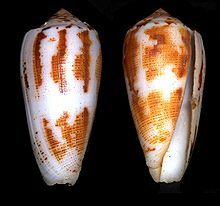 A more recent example is the N-type calcium channel blocker ziconotide analgesic which is based on a cyclic peptide cone snail toxin (ω-conotoxin MVIIA) from the species Conus magus. A significant number of anti-infectives are based on natural products. The first antibiotic to be discovered, penicillin, was isolated from the mold Penicillium. Penicillin and related beta lactams work by inhibiting DD-transpeptidase enzyme that is required by bacteria to cross link peptidoglycan to form the cell wall. Several natural product drugs target tubulin, which is a component of the cytoskeleton. These include the tubulin polymerization inhibitor colchicine isolated from the Colchicum autumnale (autumn crocus flowering plant), which is used to treat gout. Colchicine is biosynthesized from the amino acids phenylalanine and tryptophan. Paclitaxel, in contrast, is a tubulin polymerization stabilizer and is used as a chemotherapeutic drug. Paclitaxel is based on the terpenoid natural product taxol, which is isolated from Taxus brevifolia (the pacific yew tree). A class of drugs widely used to lower cholesterol are the HMG-CoA reductase inhibitors, for example atorvastatin. These were developed from mevastatin, a polyketide produced by the fungus Penicillium citrinum. Finally, a number natural product drugs are used to treat hypertension and congestive heart failure. These include the angiotensin-converting enzyme inhibitor captopril. Captopril is based on the peptidic bradykinin potentiating factor isolated from venom of the Brazilian arrowhead viper (Bothrops jararaca). Numerous challenges limit the use of natural products for drug discovery, resulting in 21st century preference by pharmaceutical companies to dedicate discovery efforts toward high-throughput screening of pure synthetic compounds with shorter timelines to refinement. Natural product sources are often unreliable to access and supply, have a high probability of duplication, inherently create intellectual property concerns about patent protection, vary in composition due to sourcing season or environment, and are susceptible to rising extinction rates. The biological resource for drug discovery from natural products remains abundant, with small percentages of microorganisms, plant species, and insects assessed for bioactivity. 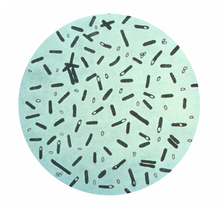 In enormous numbers, bacteria and marine microorganisms remain unexamined. As of 2008, the field of metagenomics was proposed to examine genes and their function in soil microbes, but most pharmaceutical firms have not exploited this resource fully, choosing instead to develop “diversity-oriented synthesis” from libraries of known drugs or natural sources for lead compounds with higher potential for bioactivity. Penicillin G, the first of its class fungal antibiotic, first studied by Scottish microbiologist Alexander Fleming in the late 1920s, and made practical as a therapeutic via natural product isolation in the late 1930s by Ernst Boris Chain, Howard Florey, and others, these three named scientists sharing the 1945 Nobel Prize in Medicine for the work. Fleming recognized the antibacterial activity and clinical potential of "pen G", but was unable to purify or stabilize it. 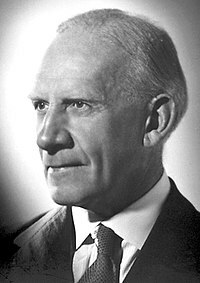 Developments in chromatographic separations and freeze drying helped move progress forward in the production of commercial quantities of penicillin and other natural products. All natural products begin as mixtures with other compounds from the natural source, often very complex mixtures, from which the product of interest must be isolated and purified. The isolation of a natural product refers, depending on context, either to the isolation of sufficient quantities of pure chemical matter for chemical structure elucidation, derivitzation/degradation chemistry, biological testing, and other research needs (generally milligrams to grams, but historically, often more), or to the isolation of "analytical quantities" of the substance of interest, where the focus is on identification and quantitation of the substance (e.g. in biological tissue or fluid), and where the quantity isolated depends on the analytical method applied (but is generally always sub-microgram in scale). [page needed] The ease with which the active agent can be isolated and purified depends on the structure, stability, and quantity of the natural product. The methods of isolation applied toward achieving these two distinct scales of product are likewise distinct, but generally involve extraction, precipitation, adsorptions, chromatography, and sometimes crystallizations. In both cases, the isolated substance is purified to chemical homogeneity, i.e. specific combined separation and analytical methods such as LC-MS methods are chosen to be "orthogonal"—achieving their separations based on distinct modes of interaction between substance and isolating matrix—with the goal being repeated detection of only a single species present in the putative pure sample. Early isolation is almost inevitably followed by structure determination, especially if an important pharmacologic activity is associated with the purified natural product. Structure determination refers to methods applied to determine the chemical structure of an isolated, pure natural product, a process that involves an array of chemical and physical methods that have changed markedly over the history of natural products research; in earliest days, these focused on chemical transformation of unknown substances into known substances, and measurement of physical properties such as melting point and boiling point, and related methods for determining molecular weight. In the modern era, methods focus on mass spectrometry and nuclear magnetic resonance methods, often multidimensional, and, when feasible, small molecule crystallography. For instance, the chemical structure of penicillin was determined by Dorothy Crowfoot Hodgkin in 1945, work for which she later received a Nobel Prize in Chemistry (1964). Many natural products have very complex structures. The perceived complexity of a natural product is a qualitative matter, consisting of consideration of its molecular mass, the particular arrangements of substructures (functional groups, rings etc.) with respect to one another, the number and density of those functional groups, the stability of those groups and of the molecule as a whole, the number and type of stereochemical elements, the physical properties of the molecule and its intermediates (which bear on the ease of its handling and purification), all of these viewed in the context of the novelty of the structure and whether preceding related synthetic efforts have been successful (see below for details). Some natural products, especially those less complex, are easily and cost-effectively prepared via complete chemical synthesis from readily available, simpler chemical ingredients, a process referred to as total synthesis (especially when the process involves no steps mediated by biological agents). Not all natural products are amenable to total synthesis, cost-effective or otherwise. In particular, those most complex often are not. Many are accessible, but the required routes are simply too expensive to allow synthesis on any practical or industrial scale. However, in order to be available for further study, all natural products must yield to isolation and purification. This may suffice if isolation provides appropriate quantities of the natural product for the intended purpose (e.g. as a drug to alleviate disease). Drugs such as penicillin, morphine, and paclitaxel proved to be affordably acquired at needed commercial scales solely via isolation procedures (without any significant synthetic chemistry contributing). However, in other cases, needed agents are not available without synthetic chemistry manipulations. The process of isolating a natural product from its source can be costly in terms of committed time and material expense, and it may challenge the availability of the relied upon natural resource (or have ecological consequences for the resource). For instance, it has been estimated that the bark of an entire yew tree (Taxus brevifolia) would have to be harvested to extract enough paclitaxel for just a single dose of therapy. Furthermore, the number of structural analogues obtainable for structure-activity analysis (SAR) simply via harvest (if more than one structural analogue is even present) is limited by the biology at work in the organism, and so outside of the experimentalist's control. In such cases where the ultimate target is harder to come by, or limits SAR, it is sometimes possible to source a middle-to-late stage biosynthetic precursor or analogue from which the ultimate target can be prepared. This is termed semisynthesis or partial synthesis. With this approach, the related biosynthetic intermediate is harvested and then converted to the final product by conventional procedures of chemical synthesis. This strategy can have two advantages. Firstly, the intermediate may be more easily extracted, and in higher yield, than the ultimate desired product. An example of this is paclitaxel, which can be manufactured by extracting 10-deacetylbaccatin III from T. brevifolia needles, then carrying out a four-step synthesis. Secondly, the route designed between semisynthetic starting material and ultimate product may permit analogues of the final product to be synthesized. The newer generation semisynthetic penicillins are an illustration of the benefit of this approach. Structural representation of cobalamin, an early natural product isolated and structurally characterized. The variable R group can be a methyl or 5'-adenosyl group, or a cyanide or hydroxide anion. The "proof" by synthesis of vitamin B12 was accomplished in 1972 by the groups of R.B. Woodward and A. Eschenmoser. In general, the total synthesis of natural products is a non-commercial research activity, aimed at deeper understanding of the synthesis of particular natural product frameworks, and the development of fundamental new synthetic methods. Even so, it is of tremendous commercial and societal importance. By providing challenging synthetic targets, for example, it has played a central role in the development of the field of organic chemistry. Prior to the development of analytical chemistry methods in the twentieth century, the structures of natural products were affirmed by total synthesis (so-called "structure proof by synthesis"). Early efforts in natural products synthesis targeted complex substances such as cobalamin (vitamin B12), an essential cofactor in cellular metabolism. Examination of dimerized and trimerized natural products has shown that an element of bilateral symmetry is often present. Bilateral symmetry refers to a molecule or system that contains a C2, Cs, or C2v point group identity. C2 symmetry tends to be much more abundant than other types of bilateral symmetry. This finding sheds light on how these compounds might be mechanistically created, as well as providing insight into the thermodynamic properties that make these compounds more favorable. Density functional theoretical (DFT), Hartree Fock, and semiempirical calculations also show some favorability for dimerization in natural products due to evolution of more energy per bond than the equivalent trimer or tetramer. This is proposed to be due to steric hindrance at the core of the molecule, as most natural products dimerize and trimerize in a head-to-head fashion rather than head-to-tail. Research and teaching activities related to natural products fall into a number of different academic areas, including organic chemistry, medicinal chemistry, pharmacognosy, ethnobotany, traditional medicine and ethnopharmacology. Other biological areas include chemical biology, chemical ecology, chemogenomics, and systems biology. Natural products chemistry is a distinct area of chemical research which was important in the history of chemistry, the sourcing of substances in early preclinical drug discovery research, the understanding of traditional medicine and ethnopharmacology, the evolution of technology associated with chemical separations, the development of modern methods in chemical structure determination by NMR and other techniques, and in identification of pharmacologically useful areas of chemical diversity space. In addition, natural products are prepared by organic synthesis, and have played a central role to the development of the field of organic chemistry by providing tremendously challenging targets and problems for synthetic strategy and tactics. In this regard, natural products play a central role in the training of new synthetic organic chemists, and are a principal motivation in the development of new variants of old chemical reactions (e.g., the Evans aldol reaction), as well as the discovery of completely new chemical reactions (e.g., the Woodward cis-hydroxylation, Sharpless epoxidation, and Suzuki–Miyaura cross-coupling reactions). Research is being carried out to understand and manipulate the biochemical pathways involved in natural product synthesis in plants. It is hoped this knowledge will enable medicinally useful phytochemicals such as alkaloids to be produced more efficiently and economically. The concept of natural products dates back to the early 19th century, when the foundations of organic chemistry were laid. Organic chemistry was regarded at that time as the chemistry of substances that plants and animals are composed of. 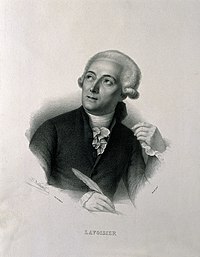 It was a relatively complex form of chemistry and stood in stark contrast to inorganic chemistry, the principles of which had been established in 1789 by the Frenchman Antoine Lavoisier in his work Traité Élémentaire de Chimie. Lavoisier showed at the end of the 18th century that organic substances consisted of a limited number of elements: primarily carbon and hydrogen and supplemented by oxygen and nitrogen. He quickly focused on the isolation of these substances, often because they had an interesting pharmacological activity. Plants were the main source of such compounds, especially alkaloids and glycosides. It was long been known that opium, a sticky mixture of alkaloids (including codeine, morphine, noscapine, thebaine, and papaverine) from the opium poppy (Papaver somniferum), possessed a narcotic and at the same time mind-altering properties. By 1805, morphine had already been isolated by the German chemist Friedrich Sertürner and in the 1870s it was discovered that boiling morphine with acetic anhydride produced a substance with a strong pain suppressive effect: heroin. In 1815, Eugène Chevreul isolated cholesterol, a crystalline substance, from animal tissue that belongs to the class of steroids, and in 1820 strychnine, an alkaloid was isolated. This reaction showed that there was no need for a life force in order to prepare organic substances. This idea, however, was initially met with a high degree of skepticism, and only 20 years later, with the synthesis of acetic acid from carbon by Adolph Wilhelm Hermann Kolbe, was the idea accepted. Organic chemistry has since developed into an independent area of research dedicated to the study of carbon-containing compounds, since that element in common was detected in a variety of nature-derived substances. An important factor in the characterization of organic materials was on the basis of their physical properties (such as melting point, boiling point, solubility, crystallinity, or color). A third step was the structure elucidation of organic substances: although the elemental composition of pure organic substances (irrespective of whether they were of natural or synthetic origin) could be determined fairly accurately, the molecular structure was still a problem. The urge to do structural elucidation resulted from a dispute between Friedrich Wöhler and Justus von Liebig, who both studied a silver salt of the same composition but had different properties. Wöhler studied silver cyanate, a harmless substance, while von Liebig investigated silver fulminate, a salt with explosive properties. The elemental analysis shows that both salts contain equal quantities of silver, carbon, oxygen and nitrogen. According to the then prevailing ideas, both substances should possess the same properties, but this was not the case. This apparent contradiction was later solved by Berzelius's theory of isomers, whereby not only the number and type of elements are of importance to the properties and chemical reactivity, but also the position of atoms in within a compound. 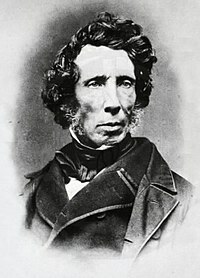 This was a direct cause for the development of structure theories, such as the radical theory of Jean-Baptiste Dumas and the substitution theory of Auguste Laurent. However, it took until 1858 before by August Kekulé formulated a definite structure theory. He posited that carbon is tetravalent and can bind to itself to form carbon chains as they occur in natural products. The concept of natural product, which initially based on organic compounds that could be isolated from plants, was extended to include animal material in the middle of the 19th century by the German Justus von Liebig. 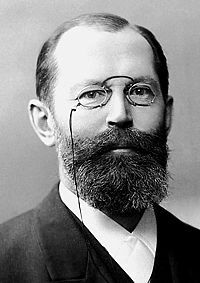 Hermann Emil Fischer in 1884, turned his attention to the study of carbohydrates and purines, work for which he was awarded the Nobel Prize in 1902. He also succeeded to make synthetically in the laboratory in a variety of carbohydrates, including glucose and mannose. After the discovery of penicillin by Alexander Fleming in 1928, fungi and other micro-organisms were added to the arsenal of sources of natural products. ^ a b Cutler S, Cutler HG (2000). Biologically Active Natural Products: Pharmaceuticals. CRC Press. p. 5. ISBN 978-0-8493-1887-0. ^ Webster's Revised Unabridged Dictionary (1913). "Natural product". Free Online Dictionary and C. & G. Merriam Co. A chemical substance produced by a living organism; - a term used commonly in reference to chemical substances found in nature that have distinctive pharmacological effects. Such a substance is considered a natural product even if it can be prepared by total synthesis. ^ "All natural". Nature Chemical Biology. 3 (7): 351. July 2007. doi:10.1038/nchembio0707-351. PMID 17576412. The simplest definition for a natural product is a small molecule that is produced by a biological source. ^ a b Samuelson G (1999). Drugs of Natural Origin: A Textbook of Pharmacognosy. Taylor & Francis Ltd. ISBN 9789186274818. ^ National Center for Complementary and Integrative Health (2013-07-13). "Natural Products Research—Information for Researchers | NCCIH". U.S. Department of Health & Human Services. Natural products include a large and diverse group of substances from a variety of sources. They are produced by marine organisms, bacteria, fungi, and plants. The term encompasses complex extracts from these producers, but also the isolated compounds derived from those extracts. It also includes vitamins, minerals and probiotics. ^ "About Us". Natural Products Foundation. Retrieved 2013-12-07. Natural products are represented by a wide array of consumer goods that continue to grow in popularity each year. These products include natural and organic foods, dietary supplements, pet foods, health and beauty products, "green" cleaning supplies and more. Generally, natural products are considered those formulated without artificial ingredients and that are minimally processed. ^ a b c Hanson JR (2003). Natural Products: the Secondary Metabolite. Cambridge: Royal Society of Chemistry. ISBN 0-85404-490-6. Natural products are organic compounds that are formed by living systems. ^ "Natural Products". Stedman's Medical Dictionary. Lippincott Williams & Wilkins. Natural products: naturally occurring compounds that are end products of secondary metabolism; often, they are unique compounds for particular organisms or classes of organisms. ^ Williams DA, Lemke TL (2002). "Chapter 1: Natural Products". Foye's Principles of Medicinal Chemistry (5th ed.). Philadelphia: Lippincott Williams Wilkins. p. 25. ISBN 0-683-30737-1. Natural product: A single chemical compound that occurs naturally. This term is typically used to refer to an organic compound of limited distribution in nature (often called secondary metabolites). ^ Maplestone RA, Stone MJ, Williams DH (June 1992). "The evolutionary role of secondary metabolites--a review". Gene. 115 (1–2): 151–7. doi:10.1016/0378-1119(92)90553-2. PMID 1612430. ^ a b Hunter P (September 2008). "Harnessing Nature's wisdom. Turning to Nature for inspiration and avoiding her follies". EMBO Reports. 9 (9): 838–40. doi:10.1038/embor.2008.160. PMC 2529361. PMID 18762775. ^ a b c d e f g Li JW, Vederas JC (July 2009). "Drug discovery and natural products: end of an era or an endless frontier?". Science. 325 (5937): 161–5. Bibcode:2009Sci...325..161L. doi:10.1126/science.1168243. PMID 19589993. ^ a b c Bhat SV, Nagasampagi BA, Sivakumar M (2005). Chemistry of Natural Products. Berlin ; New York: Springer. ISBN 81-7319-481-5. ^ Kossel A (1891). "Ueber die chemische Zusammensetzung der Zelle" [The chemical composition of the cell]. Archiv für Physiologie (in German): 181–186. ^ a b Kliebenstein DJ (2004). "Secondary metabolites and plant/environment interactions: a view through Arabidopsis thaliana tinged glasses". Plant, Cell and Environment. 27 (6): 675–684. doi:10.1111/j.1365-3040.2004.01180.x. 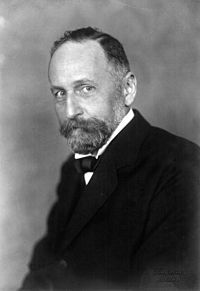 In 1891, following Stahls work on plant biochemistry, Kossel suggested a distinction between basic and secondary metabolism (Stahl 1888). ^ a b Karlovsky P (2008). "Secondary metabolites in soil ecology". Soil Biology. Soil Biology. 14: 1–19. doi:10.1007/978-3-540-74543-3_1. ISBN 978-3-540-74542-6. The current, generally accepted concept in line with Kossel’s view is that primary metabolites are chemical components of living organisms that are vital for their normal functioning, while secondary metabolites are compounds which are dispensable. ^ Rogers K (2011). The Components of Life: From Nucleic Acids to Carbohydrates (1st ed.). New York, NY: Britannica Educational Publishing in association with Rosen Educational Services. ISBN 978-1-61530-324-3. ^ a b Cox DL, Nelson MM (2013). Lehninger Principles of Biochemistry (6th ed.). New York, N.Y.: W.H. Freeman. ISBN 978-1-4641-0962-1. ^ Boal D (2006). Mechanics of the Cell (4th printing ed.). Cambridge, UK: Cambridge University Press. ISBN 978-0-521-79681-1. ^ a b c d e f g h Dewick PM (2009). Medicinal Natural Products: A Biosynthetic Approach (3rd ed.). Chichester: Wiley. ISBN 978-0-470-74167-2. ^ Sitaramayya A (1999). Introduction to Cellular Signal Transduction. Boston: Birkhäuser. ISBN 978-0-8176-3982-2. ^ Demain AL, Fang A (2000). "The natural functions of secondary metabolites". Advances in Biochemical Engineering/Biotechnology. Advances in Biochemical Engineering/Biotechnology. 69: 1–39. doi:10.1007/3-540-44964-7_1. ISBN 978-3-540-67793-2. PMID 11036689. ^ Williams DH, Stone MJ, Hauck PR, Rahman SK (1989). "Why are secondary metabolites (natural products) biosynthesized?". Journal of Natural Products. 52 (6): 1189–208. doi:10.1021/np50066a001. PMID 2693613. ^ Firn RD, Jones CG (September 2000). "The evolution of secondary metabolism - a unifying model" (PDF). Molecular Microbiology. 37 (5): 989–94. doi:10.1046/j.1365-2958.2000.02098.x. PMID 10972818. ^ Strobel G, Daisy B (December 2003). "Bioprospecting for microbial endophytes and their natural products". Microbiology and Molecular Biology Reviews. 67 (4): 491–502. doi:10.1128/MMBR.67.4.491-502.2003. PMC 309047. PMID 14665674. ^ a b Zaffiri L, Gardner J, Toledo-Pereyra LH (April 2012). "History of antibiotics. From salvarsan to cephalosporins". Journal of Investigative Surgery. 25 (2): 67–77. doi:10.3109/08941939.2012.664099. PMID 22439833. ^ Procópio RE, Silva IR, Martins MK, Azevedo JL, Araújo JM (2012). "Antibiotics produced by Streptomyces". The Brazilian Journal of Infectious Diseases. 16 (5): 466–71. doi:10.1016/j.bjid.2012.08.014. PMID 22975171. ^ Cochrane SA, Vederas JC (January 2016). "Lipopeptides from Bacillus and Paenibacillus spp. : A Gold Mine of Antibiotic Candidates". Medicinal Research Reviews. 36 (1): 4–31. doi:10.1002/med.21321. PMID 24866700. ^ Saxena A, Kumari R, Mukherjee U, Singh P, Lal R (2014). "Draft Genome Sequence of the Rifamycin Producer Amycolatopsis rifamycinica DSM 46095". Genome Announcements. 2 (4): e00662–14. doi:10.1128/genomeA.00662-14. PMC 4082003. PMID 24994803. ^ Hallett M, Albanese A, Dressler D, Segal KR, Simpson DM, Truong D, Jankovic J (June 2013). "Evidence-based review and assessment of botulinum neurotoxin for the treatment of movement disorders". Toxicon. 67 (June): 94–114. doi:10.1016/j.toxicon.2012.12.004. PMID 23380701. ^ "Bleomycin". US National Library of Medicine. Retrieved 28 January 2015. ^ Alvin A, Miller KI, Neilan BA (2014). "Exploring the potential of endophytes from medicinal plants as sources of antimycobacterial compounds". Microbiological Research. 169 (7–8): 483–95. doi:10.1016/j.micres.2013.12.009. PMID 24582778. ^ Wang X, Elshahawi SI, Shaaban KA, Fang L, Ponomareva LV, Zhang Y, Copley GC, Hower JC, Zhan CG, Kharel MK, Thorson JS (January 2014). "Ruthmycin, a new tetracyclic polyketide from Streptomyces sp. RM-4-15". Organic Letters. 16 (2): 456–9. doi:10.1021/ol4033418. PMC 3964319. PMID 24341358. ^ Wang X, Shaaban KA, Elshahawi SI, Ponomareva LV, Sunkara M, Copley GC, Hower JC, Morris AJ, Kharel MK, Thorson JS (August 2014). "Mullinamides A and B, new cyclopeptides produced by the Ruth Mullins coal mine fire isolate Streptomyces sp. RM-27-46". The Journal of Antibiotics. 67 (8): 571–5. doi:10.1038/ja.2014.37. PMC 4146655. PMID 24713874. ^ Akey DL, Gehret JJ, Khare D, Smith JL (October 2012). "Insights from the sea: structural biology of marine polyketide synthases". Natural Product Reports. 29 (10): 1038–49. doi:10.1039/c2np20016c. PMC 3709256. PMID 22498975. ^ Bertoldo C, Antranikian G (2011). "Chapter 1: Biotechnology of Archaea" (PDF). Biotechnology Vol. IX. Paris: Encyclopedia of Life Support Systems (EOLSS). ^ Thornburg CC, Zabriskie TM, McPhail KL (March 2010). "Deep-sea hydrothermal vents: potential hot spots for natural products discovery?". Journal of Natural Products. 73 (3): 489–99. doi:10.1021/np900662k. PMID 20099811. ^ Beekman AM, Barrow RA (2014). "Fungal metabolites as pharmaceuticals". Aust J Chem. 67 (6): 827–843. doi:10.1071/ch13639. ^ Dang L, Van Damme EJ (September 2015). "Toxic proteins in plants". Phytochemistry. 117: 51–64. doi:10.1016/j.phytochem.2015.05.020. PMID 26057229. ^ Crozier A, Clifford MN, Ashihara H (2006). "Chapters 1, 3 and 4". Plant Secondary Metabolites: Occurrence, Structure and Role in the Human Diet. Oxford, UK: Blackwell Publishing Ltd. pp. 1–24, 47–136. ISBN 978-1-4051-2509-3. ^ Kittakoop P, Mahidol C, Ruchirawat S (2014). "Alkaloids as important scaffolds in therapeutic drugs for the treatments of cancer, tuberculosis, and smoking cessation". Current Topics in Medicinal Chemistry. 14 (2): 239–52. doi:10.2174/1568026613666131216105049. PMID 24359196. ^ Kano S (May 2014). "Artemisinin-based combination therapies and their introduction in Japan". Kansenshogaku Zasshi. 88 (3 Suppl 9–10): 18–25. PMID 24979951. ^ Russo P, Frustaci A, Del Bufalo A, Fini M, Cesario A (2013). "Multitarget drugs of plants origin acting on Alzheimer's disease". Current Medicinal Chemistry. 20 (13): 1686–93. doi:10.2174/0929867311320130008. PMID 23410167. ^ Dossey AT (January 2010). "Insects and their chemical weaponry: new potential for drug discovery". Natural Product Reports. 27 (12): 1737–57. doi:10.1039/C005319H. PMID 20957283. ^ a b c Fernandes-Pedrosa MF, Félix-Silva J, Menezes YA (2013). An Integrated View of the Molecular Recognition and Toxinology: From Analytical Procedures to Biomedical Applications (PDF). InTechOpen. pp. 23–72. ^ Mayer AM, Glaser KB, Cuevas C, Jacobs RS, Kem W, Little RD, McIntosh JM, Newman DJ, Potts BC, Shuster DE (June 2010). "The odyssey of marine pharmaceuticals: a current pipeline perspective". Trends in Pharmacological Sciences. 31 (6): 255–65. doi:10.1016/j.tips.2010.02.005. PMID 20363514. ^ a b Bowersox SS, Luther R (November 1998). "Pharmacotherapeutic potential of omega-conotoxin MVIIA (SNX-111), an N-type neuronal calcium channel blocker found in the venom of Conus magus". Toxicon. 36 (11): 1651–8. doi:10.1016/S0041-0101(98)00158-5. PMID 9792182. ^ a b Prommer E (June 2006). "Ziconotide: a new option for refractory pain". Drugs of Today. 42 (6): 369–78. doi:10.1358/dot.2006.42.6.973534. PMID 16845440. ^ Rinehart KL (January 2000). "Antitumor compounds from tunicates". Medicinal Research Reviews. 20 (1): 1–27. doi:10.1002/(SICI)1098-1128(200001)20:1<1::AID-MED1>3.0.CO;2-A. PMID 10608919. ^ Petek BJ, Loggers ET, Pollack SM, Jones RL (February 2015). "Trabectedin in soft tissue sarcomas". Marine Drugs. 13 (2): 974–83. doi:10.3390/md13020974. PMC 4344612. PMID 25686274. ^ a b Singh R, Sharma M, Joshi P, Rawat DS (August 2008). "Clinical status of anti-cancer agents derived from marine sources". Anti-Cancer Agents in Medicinal Chemistry. 8 (6): 603–17. doi:10.2174/187152008785133074. PMID 18690825. ^ Brahmachari G (2010). Handbook of Pharmaceutical Natural Products. Weinheim: Wiley-VCH. ISBN 978-3-52732148-3. ^ Beghyn T, Deprez-Poulain R, Willand N, Folleas B, Deprez B (July 2008). "Natural compounds: leads or ideas? Bioinspired molecules for drug discovery". Chemical Biology & Drug Design. 72 (1): 3–15. doi:10.1111/j.1747-0285.2008.00673.x. PMID 18554253. ^ Koehn FE, Carter GT (March 2005). "The evolving role of natural products in drug discovery". Nature Reviews. Drug Discovery. 4 (3): 206–20. doi:10.1038/nrd1657. PMID 15729362. ^ Newman DJ, Cragg GM (March 2007). "Natural products as sources of new drugs over the last 25 years". Journal of Natural Products. 70 (3): 461–77. doi:10.1021/np068054v. PMID 17309302. ^ Gransalke K (February 2011). "Mother Nature's Drug Cabinet" (PDF). Lab Times. 11 (1): 16–19. Drug Discovery - Is Mother Nature still the number one source for promising new drugs? ^ Patrick GL (2013). "12.4.2: Medical Folklore". An introduction to medicinal chemistry (Fifth ed.). Oxford: Oxford University Press. ISBN 978-0-19-969739-7. ^ Sneader W (2005). "Part 1: Legacy of the Past". Drug Discovery: A History (Rev. and updated ed.). Chichester: Wiley. pp. 280–283. ISBN 978-0-471-89979-2. ^ Atanasov AG, Waltenberger B, Pferschy-Wenzig EM, Linder T, Wawrosch C, Uhrin P, Temml V, Wang L, Schwaiger S, Heiss EH, Rollinger JM, Schuster D, Breuss JM, Bochkov V, Mihovilovic MD, Kopp B, Bauer R, Dirsch VM, Stuppner H (December 2015). "Discovery and resupply of pharmacologically active plant-derived natural products: A review". Biotechnology Advances. 33 (8): 1582–614. doi:10.1016/j.biotechadv.2015.08.001. PMC 4748402. PMID 26281720. ^ Schrör K (2008). "Chapter 1.1: History". Acetylsalicylic Acid. Weinheim: Wiley-VCH. pp. 5–24. ISBN 978-3-527-62600-7. ^ Busse GD, Triggle DJ (2006). "The history of opium and morphine". Morphine. New York: Chelsea House Publishers. pp. 8–23. ISBN 978-1-4381-0211-5. ^ Lewis RJ, Dutertre S, Vetter I, Christie MJ (April 2012). "Conus venom peptide pharmacology". Pharmacological Reviews. 64 (2): 259–98. doi:10.1124/pr.111.005322. PMID 22407615. ^ de la Bédoyère G (2005). The discovery of penicillin. London: Evans. ISBN 978-0-237-52739-6. ^ Hartung EF (September 1954). "History of the use of colchicum and related medicaments in gout; with suggestions for further research". Annals of the Rheumatic Diseases. 13 (3): 190–200. doi:10.1136/ard.13.3.190. PMC 1006735. PMID 13198053. ^ Sneader W (2005). "Paclitaxel (taxol)". Drug Discovery: A History (Rev. and updated ed.). Chichester: Wiley. pp. 112–113. ISBN 978-0-471-89979-2. ^ Li JL (2009). "Discovery of Lipitor". Triumph of the Heart: the Story of Statins. New York, NY: Oxford University Press. pp. 71–96. ISBN 978-0-19-804351-5. ^ Sneader W (2005). "ACE Inhibitors". Drug Discovery: A History (Rev. and updated ed.). Chichester: Wiley. pp. 280–283. ISBN 978-0-471-89979-2. ^ Gomez-Escribano JP, Alt S, Bibb MJ (April 2016). "Next Generation Sequencing of Actinobacteria for the Discovery of Novel Natural Products". Marine Drugs. 14 (4): 78. doi:10.3390/md14040078. PMC 4849082. PMID 27089350. ^ a b Pawar SV, Ho JC, Yadav GD, Yadav VG (2017). "The Impending Renaissance in Discovery & Development of Natural Products". Current Topics in Medicinal Chemistry. 17 (2): 251–267. doi:10.2174/1568026616666160530154649. PMID 27237327. ^ Blow N (May 2008). "Metagenomics: exploring unseen communities". Nature. 453 (7195): 687–90. Bibcode:2008Natur.453..687B. doi:10.1038/453687a. PMID 18509446. ^ Brown K (2009). "That's funny! ': the discovery and development of penicillin". Microbiology Today. 36 (1): 12–15. ^ Gower D, Makin HL, eds. (2009). Steroid Analysis (2nd ed.). Dordrecht: Springer. ISBN 9781402097744. ^ Hodgkin DC. "Enhancing X-ray Vision". The Nobel Prize in Chemistry 1964 - Perspectives. ^ "The Story of Taxol" (PDF). The American Society of Pharmacognosy. Archived from the original (PDF) on 2013-12-12. ^ Hodgkin DC, Kamper J, Mackay M, Pickworth J, Trueblood KN, White JG (July 1956). "Structure of vitamin B12". Nature. 178 (4524): 64–6. Bibcode:1956Natur.178...64H. doi:10.1038/178064a0. PMID 13348621. ^ a b Woodward RB (1973). "The total synthesis of vitamin B 12". Pure and Applied Chemistry. 33 (1): 145–77. doi:10.1351/pac197333010145. PMID 4684454. ^ a b Eschenmoser A (January 1988). "Vitamin B12: Experiments Concerning the Origin of Its Molecular Structure". Angewandte Chemie International Edition in English. 27 (1): 5–39. doi:10.1002/anie.198800051. ^ a b Heathcock CH (1996). "As We Head into the 21st Century, Is there Still Value in Total Synthesis of Natural Products as a Research Endeavor?". Chemical Synthesis. NATO ASI Series. 320. pp. 223–243. doi:10.1007/978-94-009-0255-8_9. ^ a b Nicolaou KC, Vourloumis D, Winssinger N, Baran PS (January 2000). "The Art and Science of Total Synthesis at the Dawn of the Twenty-First Century". Angewandte Chemie. 39 (1): 44–122. doi:10.1002/(SICI)1521-3773(20000103)39:1<44::AID-ANIE44>3.0.CO;2-L. PMID 10649349. ^ Lightner DA (2013). Bilirubin: Jekyll and Hyde Pigment of Life: Pursuit of Its Structure Through Two World Wars to the New Millenium. Springer. p. 371. ISBN 3709116376. ^ Voloshchuk T, Farina NS, Wauchope OR, Kiprowska M, Haberfield P, Greer A (July 2004). "Molecular bilateral symmetry of natural products: prediction of selectivity of dimeric molecules by density functional theory and semiempirical calculations". Journal of Natural Products. 67 (7): 1141–6. doi:10.1021/np049899e. PMID 15270568. ^ Glenn WS, Runguphan W, O'Connor SE (April 2013). "Recent progress in the metabolic engineering of alkaloids in plant systems". Current Opinion in Biotechnology. 24 (2): 354–65. doi:10.1016/j.copbio.2012.08.003. PMC 3552043. PMID 22954587. ^ "Antoine Laurent Lavoisier The Chemical Revolution". International Historic Chemical Landmark. American Chemical Society. ^ a b Dias DA, Urban S, Roessner U (2012). "A historical overview of natural products in drug discovery". Metabolites. 2 (4): 303–36. doi:10.3390/metabo2020303. PMC 3901206. PMID 24957513. ^ Wöhler F (1828). "Ueber künstliche Bildung des Harnstoffs" [About the artificial formation of urea]. Annalen der Physik und Chemie (in German). 88 (2): 253–256. Bibcode:1828AnP....88..253W. doi:10.1002/andp.18280880206. ^ "Justus von Liebig and Friedrich Wöhler". Science History Institute. ^ Liebig J (1838). "Ueber Laurent's Theorie der organischen Verbindungen" [About Laurent 's theory of organic compounds]. Annalen der Pharmacie (in German). 25 (1): 1–31. doi:10.1002/jlac.18380250102. ^ Kekulé A (1858). "Ueber die Constitution und die Metamorphosen der chemischen Verbindungen und über die chemische Natur des Kohlenstoffs" [Concerning the constitution and the metamorphosis of the chemical compounds and the chemical nature of the carbon]. Annalen der Chemie und Pharmacie (in German). 106 (2): 129–159. doi:10.1002/jlac.18581060202. Bhat SV, Nagasampagi BA, Sivakumar M (2005). Chemistry of Natural Products (2 ed.). Berlin: Springer. ISBN 3-540-40669-7. Hanson JR (2003). Natural Products: The Secondary Metabolites. Royal Society of Chemistry. ISBN 0-85404-490-6. Kaufman PB (1999). Natural Products from Plants. CRC Press. ISBN 0-8493-3134-X. Liang XT, Fang WS, eds. (2006). Medicinal Chemistry of Bioactive Natural Products. Wiley-Interscience. ISBN 0-471-73933-2. Wikimedia Commons has media related to Natural products. Reusch W (2010). "Natural Products page". Virtual Textbook of Organic Chemistry. Ann Arbor, Mich.: Michigan State University, Department of Chemistry. Archived from the original on 3 February 2007. "NAPROC-13 Base de datos de Carbono 13 de Productos Naturales y Relacionados (Carbon-13 Database of Natural Products and Related Substances)". Spanish language tools to facilitate structural identification of natural products. Porter N, ed. (1913). "Natural product". Webster's Dictionary. Springfield, Massachusetts: C. & G. Merriam Co.